Duck was driving his truck when he got stuck in the yucky brown muck. Luckily for Duck, some friendly animals see that he is stuck and come to lend a helping hand. We meet a sheep in a jeep; a frog in a bush that gave the truck a push; and goat in a boat. But, who will be the one to get Duck unstuck? 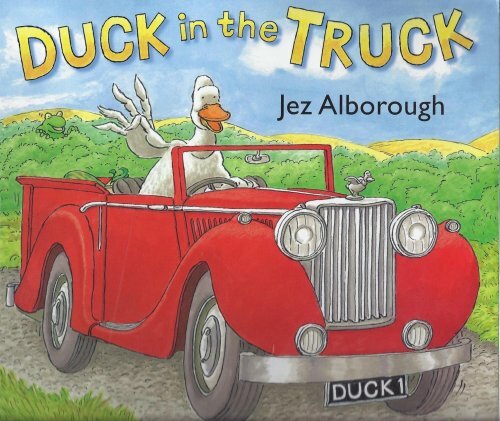 Duck in a Truck is a fun rhyming book with lots of repetition of the final /k/ sound. There are many action verbs for children to learn and it is a particularly good book to teach the verbs ‘push’ and ‘pull. Kids really enjoy the suspense of finding out how duck will get out of the mud and offering their own suggestions to solve duck’s problem. Although duck is a bit rude at the end of the story (he driving off leaving the other animals stuck in the muck), this could lead to some valuable discussion about being nice to others who try to help even when we’re feeling frustrated. For further speech and language targets in the Duck in the Truck, see the list below.